Our first tale is set on earth, in Morocco to be exact. It's a science fiction adventure story set some 1,000 years in the future, so there are quite a few aliens about. We don't have a super-nerdy series bible or fancy codex that catalogs all the different species of alien yet, but we might some day... if I get terribly, terribly bored. 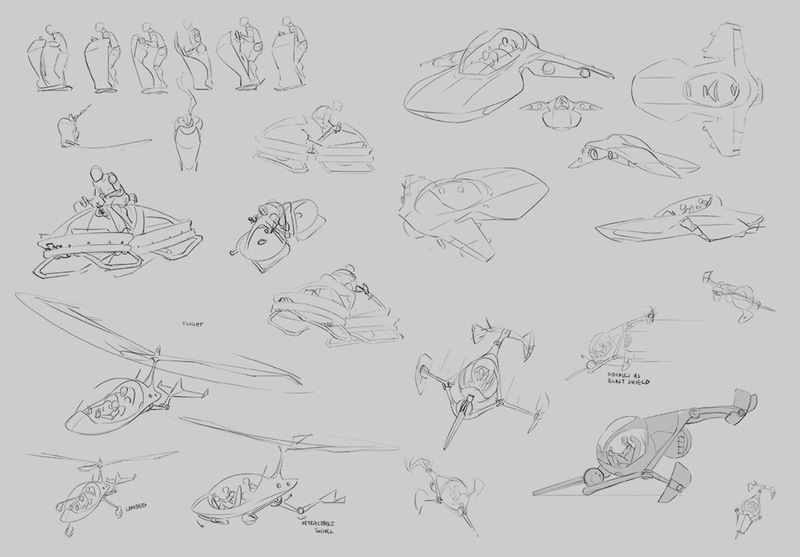 In the designs below, Shof wanted to explore alien designs that seemed familiar but different, and have fun in the process. Here's what he came up with. Aliens aren't uncommon on Earth in 30XX. Many aliens come here to conduct illicit trades, search for valuable archaeological artifacts, find menial employment, and escape from the law. I'd never go as far as calling it a retched hive of scum and villainy, but the planet is considered a fringe world, with only tenuous trade links to the legal solar economy. It has also been largely reclaimed by nature following a series of cataclysmic seismic events in the latter half of the 28th century. The few scattered cities that remain are all dangerous in their own unique ways. These vehicles were designed while we were trying to figure out how our heroes might escape if they survived their daring rescue mission. Shof explored everything from complicated helicopter style designs to sleek flying cars and Flash Gordon-esque standing-bucket-segway-thingies. In the end, this plot thread was largely dropped, but the visual development was helpful in fleshing out the look of the world, and figuring out how folks get around in Morocco in 30XX.